Hunt property with income! 37 acres on Mt. Zion Road 4+- miles East of Benton IL. 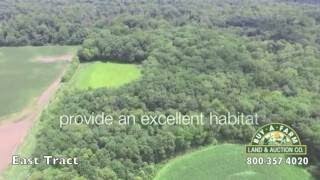 There is 21.69 acres of cropland and the balance is wooded with a creek on the South tract. Both tracks corner at a 90 degree turn in the road and both have road frontage. Lots of Deer! The property is presently leased for bow season and has been by the same person for several years. Wet areas in the woods along the creek tend to draw quite an array of ducks. Cropland has a PI of 105.3 with a weighted corn average of 141.6 bpa. 2017 taxes paid 2018: $222.92. Originally listed at $129,500 / $3,500 per acre.